The Japanese Government is offering scholarship for foreign students interested to take up Japanese studies. To date, there are over 9,000 foreign students studying in Japan under this scholarship grant. 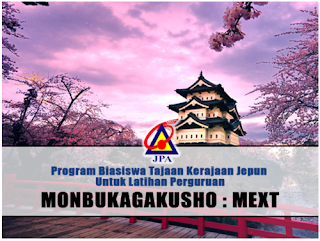 The Ministry of Education, Culture, Sports, Science and Technology (MEXT) of Japan offers scholarships tointernational students who wish to study for a period of one year at designated Japanese universities as Japanese Studies Students in order to deepen their understanding of the Japanese language, Japanese affairs and Japanese culture under the Japanese Government (MEXT) Scholarship Program as follows. Allowance of 117,000 yen per month. A supplemental regional allowance of 2,000 or 3,000 yen per month will be added to the monthly scholarship amount for the grantees studying or conducting research in specially designated regions. Due to the situation of the Japanese Government’s budget, the amount of payment may be subject to change each fiscal year. If a grantee is absent from the university for an extended period, the scholarship shall be suspended for that period. Fees for the entrance examination, matriculation and tuition at universities will be paid by MEXT. Travel expenses (transportation to and from Japan). Download the forms online at this link. CLOSE DATE : 13 FEB 2019 | APPLY NOW! !